If I didn't want my students to know about the blog, I'd get this license plate, too. OK, since Quod She 1.0 is/was a Blogger blog, and it’s thus owned by Google, it tends to come up in Google searches pretty easily. Right now, if you search “Dr. Virago” on Google, it comes up very first — hooray! — and my Blogger profile comes up sixth. But this blog is down at the bottom. (Meanwhile, my LiveJournal profile page comes up on the third page and my Technorati page shows up on page 4, along with mentions of me on other people’s blogs.) Apparently Virago is also the brand of a motorcycle starter system (weird), so a guy incorporating that into his name shows up with me on the first page. More annoying is that there’s another Dr. Virago blogging (or at least commenting) out there (she shows up on page 2). Since she also considers herself a feminist, someone could, potentially confuse us. 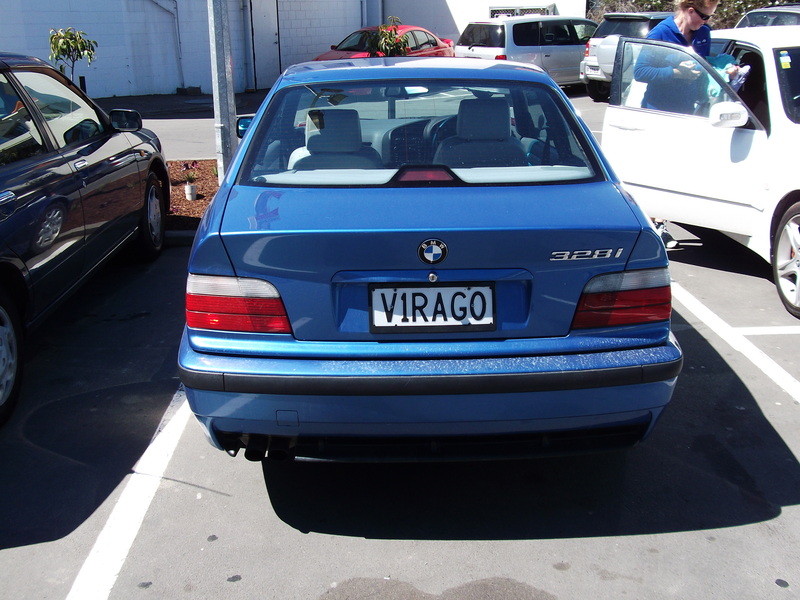 But that Dr. Virago is not this Dr. Virago. Just so you know. Oh, also, there’s Blogger blog called Dr. Virago (instead of Quod She) that shows up on the fourth or fifth page, but it’s in Spanish and I don’t speak or write Spanish, so I’m pretty sure no one will confuse us. Things I’ve done are in bold. Things I am indifferent towards or actively would like to avoid are crossed out. Things in normal type face are things I’d like to do. Comments in parentheses are my addition. I got this version from Squadratomagico (though I took off her additions). 29 — I better get cracking! >This one’s for the Pastry Pirate. Hat tip to Another Damned Medievalist. Btw, here are the actual words to “O Fortuna,” in case you want them. >New Kid tagged me awhile back for the 6 word memoir meme, and it’s been driving me crazy ever since. But, after writing the last post, I figured out the *perfect* 6-word memoir for myself. 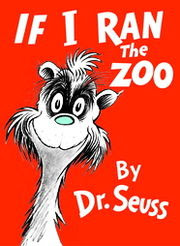 Granted, all but one word of the following belong to the inimitable Dr. Seuss, but that’s part of the point — it’s a literary allusion, see? I’m going to tag two bloggers I know haven’t done this yet — Tommy at Macerating Shallots and also The Pastry Pirate (because I’d like to see her try to fit *her* life into six words! hee!) — and if you haven’t either, consider yourself tagged if you wish. >Bullock, don’t go any further. >Although my last post talked about inspiration, for some reason I haven’t felt all that inspired to blog in the last week. Things are kind of busy around here, too — job candidate visits, a book review that I need to finish (and that’s causing me a bit of “imposter syndrom” anxiety), an article due in March that’s in progress, and the usual teaching and advising stuff. In the meantime, you may not have noticed this if you read me in an RSS feeder, but I redesigned the blog over the holidays. I’m still fiddling a little, which you may have noticed by my constantly changing avatar. First it was a South Park style image of me — or close enough — that I made some time ago when everyone was doing those things, but never used. But that was just a place holder until I decided which photographic image of myself to use. I settled on a picture that the Pastry Pirate took back in 2004 when we did a week’s hiking trip around the Isle of Man. The fact that my back is turned is useful and functional for a pseudonymous blog (although if you know me you’d probably recognize me in an instant, even with my hair in braids — but that’s OK, too), but I also like its somewhat melancholy, wistful, or at least contemplative spirit and its suggestions of journeys, stopping places, horizons, and points of view. Oh, and if you haven’t noticed it, the picture at the bottom of the front page of the blog is one I took in Cumbria in 2004. There was this old stone mill house that had been renovated into a modern home, and in addition to its general coolness, the owner had a great talent for gardening in a limited space. This particular planting was in a hole in the garden wall. I just think it’s pretty — it doesn’t really mean anything, except that it’s English. Anyway, I’ve got some things to post about and will start back up again today. >I’m definitely going to have to take an Ambien tonight because it’s 11 p.m. and I feel like it’s about 7 p.m. But first, before I make offerings to Morpheus, Dance has tagged me for a meme. If I do it right away, I won’t let it slip like I generally do all other memes. 1. I freak out when any TV show, book, or movie mentions internal bleeding or organ failure. Since I like police procedurals, this happens more often that you’d think. 2. I remember the very first moment I consciously realized what emotional intimacy was outside of a family relationship. (Or maybe it’s just the first moment I remember.) I was in 2nd grade and playing with my friend Teresa. She was showing me something to do with one of her dolls or stuffed animals that only she knew — some bald patch in its hair or something like that — and I was suddenly struck with a sense of the two us being alone in the world, but connected. I don’t remember the external details very clearly, but I remember the feeling of warmth. 4. I have been flirted with by an orangutan named Bruno. 7. I love the logic games on the GRE. OK, I’m going to break rules 3-4 and just say that if you haven’t done this meme yet (and I know many of you have at one time or another) and you want to, consider yourself tagged.